Having been around this snowmo-biz as an opinionated editor since the mid-1970s, I find it heartening to see another attempt to invite new and ride-again winter enthusiasts to experience our sport. 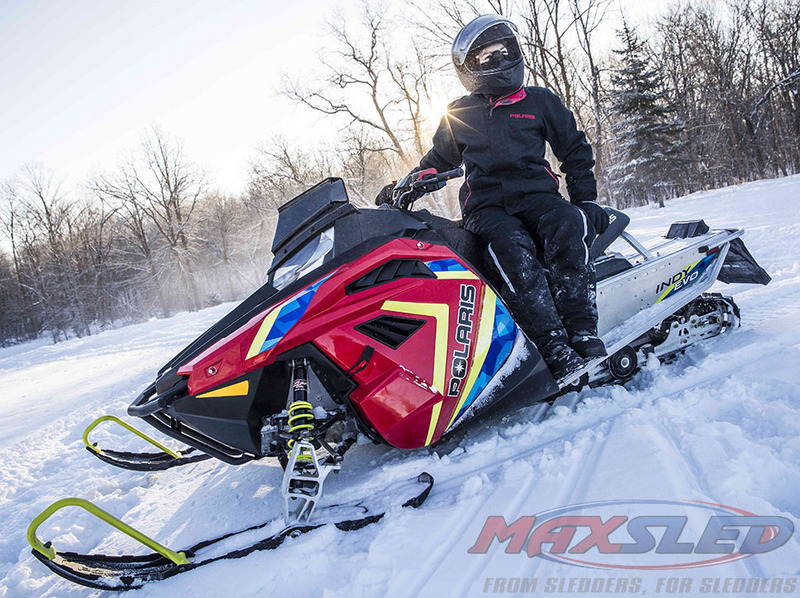 This introduction of “new rider” sleds like the recently announced Polaris Indy Evo and the “bridge” 200cc sleds from the snowmobile partnership of Arctic Cat and Yamaha may seem new, but not to me. The born-again Yamaha SnoScoot is designed to bridge the gap from the mini-120s up to full size sleds. I had just begun my snowmobiling editorship with Manhattan-based Invitation to Snowmobiling when I was introduced to another of Polaris’ “new rider” concepts, the so-called TC, short for town & country. It was designed to fit into a station wagon, the minivan of the ‘70s. The idea was to attract suburbanites to load up their “family” sled and head to an accepting golf course or local park area. The idea wasn’t all bad, but it failed. A few seasons later, the snowmobile companies created new but bigger versions of “new rider” sleds like a downsized Polaris Colt, Scorpion Lil Whip and the continuation of Ski-Doo’s Elan. These were actually ride-able and fun. But as the economy tightened so did enthusiasm for these low profit sleds. Essentially that has been the story behind the dearth of “new rider” models. Believe that the snowmobile industry recognizes the lack of growth in the new rider segments. But, they have some problems in truly advancing full throttle to generate a new and younger riding population. Maybe now is the time. It remains to be seen. Regardless, the all-new Yamaha Snoscoot and the Cat ZR 200 do bridge a riding gap between the youth-oriented 120s. And, Polaris offers those who outgrow the 200s a nice step up in performance and capabilities with the Indy Evo, a reimagined Polaris 550 Indy. 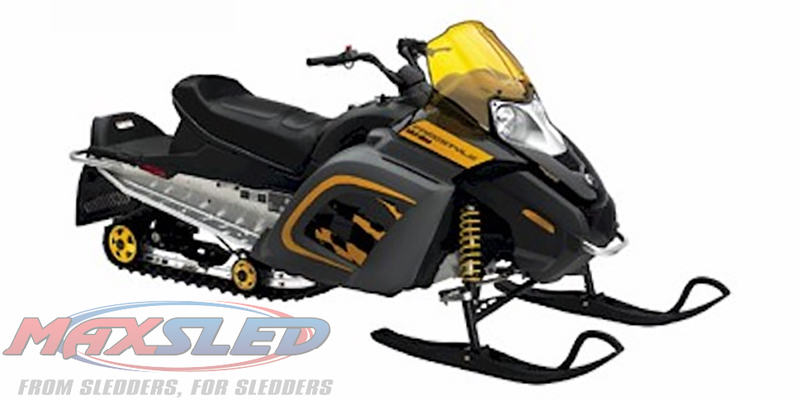 The 2006 Ski-Doo Freestyle used a familiar single cylinder Rotax 300cc two-stroke, but now it powered a modern sled with A-arm front suspension and all new styling that was designed to attract the hip youth of the day. Let’s step back into snowmobile past once again. At the beginning of this century Ski-Doo reimagined its own past and conjured up a modern, by 2006 standards, and nifty new 300cc Olympique remake. The 2006 Ski-Doo Freestyle used a familiar single cylinder Rotax 300cc two-stroke, but now it powered a modern sled with A-arm front suspension and all new styling that was designed to attract the hip youth of the day. Keep in mind that by 2006 annual sled sales had fallen to about 165,000 units a year, down from the 260,000 plus sold at the end of the 1990s. That’s a loss of 100,000 sales in less than a decade. Ouch! Sled marketers aren’t blind. Unfortunately, the Freestyle, as an attempt to reinvigorate the new sled market, ultimately failed. Fast forward to today. Current sled sales were at 118,000-plus for 2017. What to do? 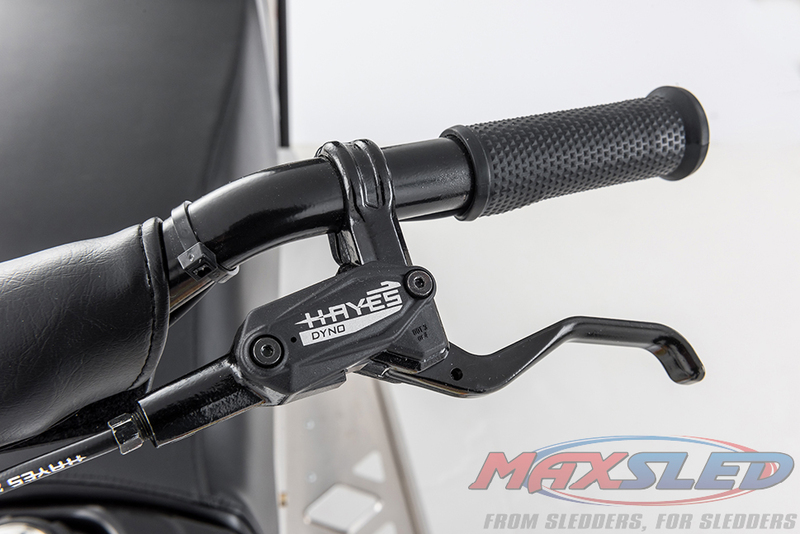 The 200s from Cat and Yamaha feature a Hayes hydraulic brake that comes to snowmobiling via the mountain bike industry. Obviously, the sled makers see a problem. While strong back-to-back-to-back snowy winters would assuredly mitigate some problems, it won’t appease all. 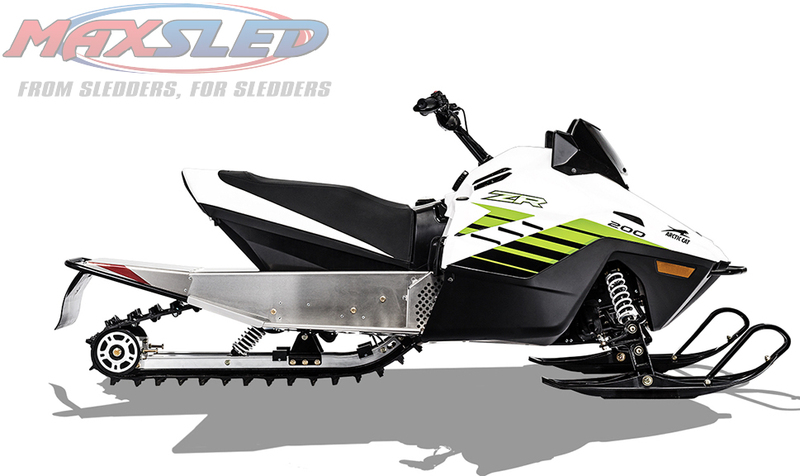 Sleds are viewed as being expensive and their seasonal usage as short compared to side-by-sides and ATVs. The purchase of an ATV or SxS that can be used virtually year around makes it difficult to justify buying a new top of the line sled. That’s where the used sled market has come in handy. The desired models have become limited and used sleds for youthful or new riders are frequently unfit. That’s why Polaris revamped its Indy 550 into a new standalone evolution model, the Indy Evo. 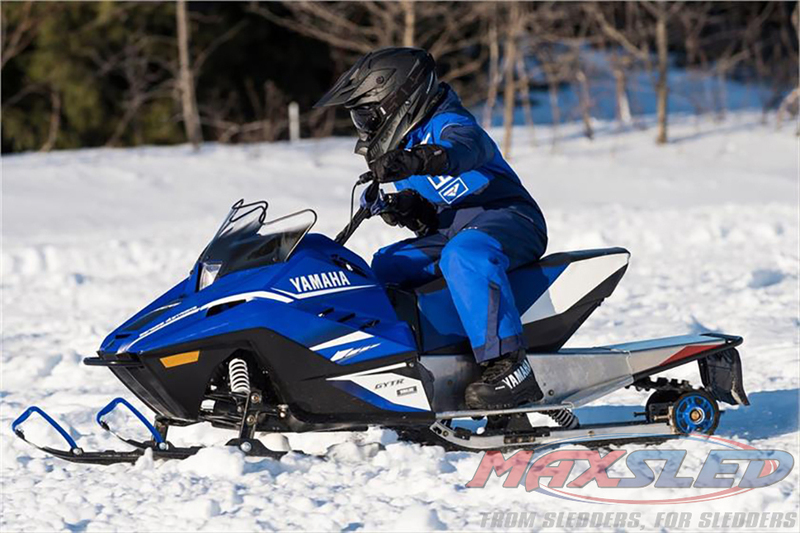 And it’s why Yamaha and Cat created a sled that could bridge mini-120 riders from newbie to trail status. According to Cat and Yamaha marketing types, their 200s have sold out. That’s nice, but we can suspect that may be due to a careful overall build prospectus. If you consider that these sleds might account for up to 4 percent of new 2018 sled sales, then we’re looking at a build of 4,000 units. That’s a careful estimate. Consider, though, that the sled makers have to make a place to build a low profit unit against the numbers of good profit mountain sleds. While snowmobilers and publication editors may clamor for smaller, lower priced units are they correct? Cat’s version of the “bridge” 200 features a 9 hp Yamaha four-stroke with Cat-designed drive system. We did a totally unscientific survey of You Tube sled videos to help us ascertain the interest in the real world between potential low performance sleds and the top sellers. As an example, we found a You Tube review of Ski-Doo’s 2018 Summit X 175 suggesting a “watched” number of nearly 300,000 views. Compare that to Cat’s ZR200 with 27,000 views or Yamaha’s SnoScoot at a best of 83,000 views in a category where normal viewership ranged from 2,000 to 43,000. Polaris’ just announced Indy Evo rated 23,000 pairs of eyes while its 800 Pro-RMK gathered in more than twice that number for a not-so-new model. Polaris revised its base 550 Indy to form a “new rider” Indy Evo that features an electronically 550cc fan-cooled twin, a lowered seat and narrowed profile. I applaud these companies for their effort to create new models for a long-overlooked audience. I especially applaud Yamaha and Polaris for their video “sell” package that shows family snowmobiling. Yamaha takes us to a snowmobiling cabin where Dad brings up two SnoScoots so that the boy and girl can trail ride with their Mom and Dad. Polaris shows us an anxious wannabe youthful snowmobiler who wants to ride with her Dad, but until the arrival of the Indy Evo is too small to fit a normal sled. Let’s credit Polaris with recognizing the intimidation of too big and solving that issue by lowering the seat, relaxing the handlebar position, narrowing the sled size and revamping its proven 550cc fan-cooled twin with speed appropriate electronic engine control. Are these sleds the answer? Are we headed in the right direction to reinvigorate our sport? At least the industry is making an attempt at moving the sales numbers upward. But it has been since the beginning.